The past two weeks were mostly quiet in the energy sector. The contraction of the petroleum industry goes on without much highlight from the press; the Brent index seems stuck at 60 $/b for the moment. Could this just be the calm before the storm? Or the entrance into a long period in the doldrums? This was perhaps a good moment for an update on the "grand scheme of things", with the publication a week ago of the Loglet Analysis re-run. In a remarkable coincidence, D. Coyle had published an update to the Shock Model, less than 24 hours before. Whilst fundamentally different, the two methods yield similar results: an overall peak within this decade and the loss of some 40 Mb/d between now and 2050. The Loglet Analysis yields a slightly steeper decline, possibly for it is not able at this stage to account for heavy petroleum as well as the Shock model does. We are standing at the edge, at the edge of our time. 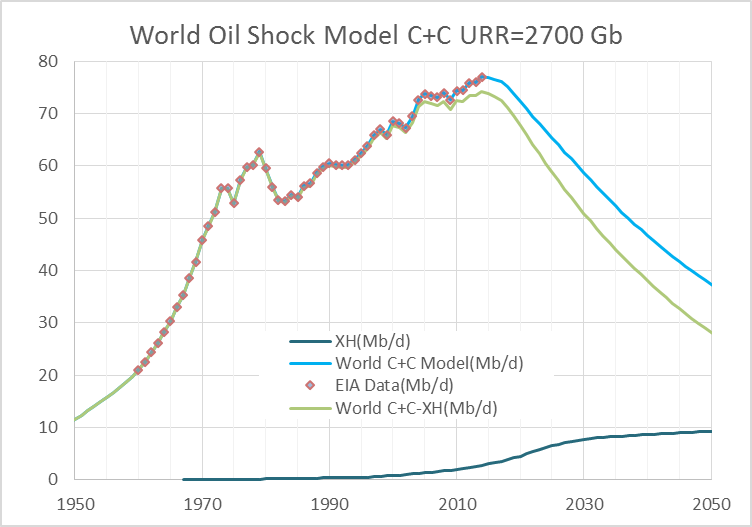 The Oil Shock Model was first developed by Webhubbletelescope and is explained in detail in The Oil Conundrum. (Note that this free book takes a while to download as it is over 700 pages long.) The Oil Shock Model with Dispersive Discovery is covered in the first half of the book. I have made a few simplifications to the original model in an attempt to make it easier to understand. For a shorter term perspective is the monthly Vital Statistics series issued by Euan Mearns. Note that Euan includes agricultural products in his accounting. Interesting how the downturn in the petroleum industry is percolating into the housing market. This is the tail of the Shale Subprime coin, whose dimension for now remains largely unknown. The petroleum industry is just the first piece of the domino. The pain of crude’s collapse is beginning to bite in Alberta, from the oil-sands boomtown of Fort McMurray to the corporate boardrooms of Calgary. As the C$340-billion ($270 billion) petro-economy confronts an oil market meltdown, a decade-long investment spree is being reversed, layoffs and spending cuts are in full swing at companies such as Suncor Energy Inc., and everyone from oil drillers to real estate agents is feeling the pinch. In Fort McMurray, where the oil is so near the surface it oozes out of the ground in places and coats people’s boots, the mayor is reconsidering city projects. In Calgary, which boasted Canada’s biggest concentration of millionaires and one of the hottest real-estate markets, realtors just had their worst two months on record. The Bank of Canada has cut interest rates in an effort to limit the damage from spreading to the rest of economy. If Canada was greatly responsible for the collapse of petroleum prices, it is also one of its greatest victims. Heavy petroleums simply do not work at 60 $/b and the tar sands industry is enduring a deep shake up. Royal Dutch Shell PLC has scrapped plans for a long-delayed oil sands mine, becoming the latest company to pull the plug on a major Alberta expansion as crude prices hover near multiyear lows. The global oil giant said on Monday it is withdrawing an application with federal regulators to build its Pierre River mine north of Fort McMurray, Alta., effectively killing a 200,000 barrel-a-day project that had been dormant for years. The decision underscores challenges faced by even the most well-funded and experienced players in Alberta’s energy sector, which has been hammered by the sharp plunge in benchmark oil prices since last summer. West Texas Intermediate oil on Monday fell 2.7 per cent to $49.81 (U.S.) a barrel, down from more than $100 last June and well under the break-even threshold analysts say is needed to justify brand new oil sands expansions. Present petroleum prices do not pose problems only for the tar sands, contraction is taking place pretty much everywhere. With spending cutbacks already taking their toll on global upstream activity, oil companies are being forced to rethink their approach to Africa’s vulnerable high-risk, high-reward exploration frontiers. Low oil prices have only added to the mounting challenges for the host of companies which have pumped billions of dollars into African hotspots over the last decade. Regulatory uncertainty, corruption, a lack of skilled labor and poor infrastructure remain key hurdles. High exploration costs were already a burden in Africa, but now many smaller, often highly-leveraged, oil companies are faced with tough choices as banks and shareholders fret over the value of their investments. Arthur Berman is one analyst predicting a longer period at present low petroleum prices, with the industry enduring more pain in the months to come. Oil prices don’t change based on weekly rig count reports. Yet every week, there are proclamations by analysts that oil prices are poised to recover because of some change in the Baker Hughes North American rig count. Others state that U.S. tight oil production will continue to rise despite falling rig counts because of the miracle of shale rig efficiency. What this really means is that nobody has any idea about when oil prices will rebound. As I have previously written, that is because nothing has happened so far to cause a change in oil prices. On the geo-political side of things: a remarkable article on the destruction of Libya that makes up for some quality weekend reading. The role played by the mainstream media in Libya's fate should not be overlooked, and calls for extreme caution in the way it paints other conflicts. Meanwhile, speculation presists on a second foreign military intervention in Libya, leaded by Italy. That verdict, however, turns out to have been premature. After some weeks of indecision, the fighting in Ukraine seems definitely fading down. The country is effectively divided in two and for the moment a re-unification seems more than remote. Fighting has eased between Ukrainian government forces and pro-Russia separatists in recent days as both sides have begun to withdraw heavy weapons but the greater danger now confronting Ukrainians is collapse of their debt-strangled economy. The national treasury's hard currency holdings are estimated to have dwindled to less than $5.5 billion, or about as much as importers have traditionally spent every three weeks. The hryvnia currency lost more than half its value in February, plunging to a record 34 against the U.S. dollar by Thursday. The dollar bought only eight hryvnia before the tumult of a government overthrow and separatist rebellion early last year. Some interesting points below on the farcical economic sanctions imposed on Russia. The collapse of petroleum and coal prices have hurt far more the Russian economy than the purposeless, make believe sanctions from the EU. Energy exports from Russia, in the form of coal, oil, natural gas and uranium, continue to flow unimpeded, despite Western efforts to damage the Russian economy for interfering in Ukraine. In some ways, the sanctions have had the desired effect. But in others, notably the energy trade, they have failed, and in fact it could be argued they have backfired, by hurting the businesses that do business with Russia. Moreover, the sanctions have further isolated Russia from Europe and drawn it closer to alternative energy partners, namely Turkey and China. In Iraq things seem also to be turning, with the first major counter-offensive against the Islamic State under way. Iran remains the most committed ally to Iraq. More than 25,000 Iraqi troops and militia fighters began a long-awaited operation Monday to retake the central Iraqi city of Tikrit, Saddam Hussein’s hometown, from the Islamic State in what many see as a test of the central government’s ability to retake and hold much of the territory lost to the militant group last summer. The operation was announced Monday morning by Iraqi state television and came just one day after Iraqi Prime Minister Haider al Abadi warned the restive Sunni tribes of central Iraq, many of which have sided with the proto-caliphate, that this was their last chance to rejoin the Iraqi central government. Although the Iraqi army and its Iranian-trained and -equipped Shiite militia allies have attempted to capture Tikrit in the past, only to suffer embarrassing defeats at the hands of the well-equipped and disciplined Islamic State fighters, Monday’s operation appeared to be the most serious attempt yet, as tens of thousands of troops, militias and even a handful of local Sunni tribesmen encircled the city from four sides and began pushing into its center behind a heavy wave of artillery, rocket and airplane bombardment. The sanctions to Russia and the equivocal action of NATO towards the Islamic State is re-approaching Moscow and Tehran. This could lead to an important upgrade to Iran's military technology, further shifting power in the region. Russia has reportedly offered to sell Iran powerful and advanced anti-aircraft missiles in a deal that could have an impact on nuclear talks approaching a deadline next month. Sergei Chemezov, head of the Russian state arms conglomerate Rostec, was quoted by the Tass news agency as saying the firm was willing to supply Tehran with Antey-2500 missiles with the capability of intercepting and destroying ballistic and cruise missiles as well as aircraft. Chemezov said Tehran was considering the offer. If the sale goes ahead, the missiles are likely to represent a significant defence against any future air strikes aimed at Iran’s nuclear facilities, and so could in theory diminish pressure on Iran to come to an agreement in nuclear negotiations. Conversely, if the talks fail, a missile deal could raise pressure from Israel and from US hawks for military action before the delivery of the Russian weapons makes air strikes riskier and less effective. The following story may look more like a curiosity than anything else. It is however a remarkable example of the resource constrains we face today; a small shift in technology or fashion trends can easily have relevant implications. How Much Gold Will the Apple Watch Edition Consume? The Wall Street Journal has reported that Apple plans to ramp up production of the Apple Watch Edition to over 1 million units per month in its second quarter of production. That’s an unbelievable number of gold watches, especially considering that they could cost as much as $10,000 each. Could this number be realistic? If Apple makes 1 million Apple Watch Edition units every month, that equals 24 million troy ounces of gold used per year, or roughly 746 metric tons. Finishing off an optimistic overview on renewable energy put out by the Deutsche Bank. While the progress in energy storage in recent years has been nothing short of spectacular, it is important to remind that these technologies have been seriously constrained by taxes and legislation in Europe. A major new Deutsche Bank report has predicted that energy storage – the “missing link of solar adoption” – will be cheap enough – and technologically ready – to be deployed on a large-scale within the next five years. The solar industry report, published on Friday, said that while costs for the greater majority of available battery technologies remained prohibitive, economically competitive batteries were the “killer app” and the “holy grail” of solar penetration. But with many costs already lower than published literature would suggest, Deutsche Bank believes this ultimate solar and renewable energy goal might not be far out of reach. An agreement between Iran and UN representatives on the former's Nuclear programme could be imminent. This will likely be the most relevant story in the days to come.